Press Conference at Otakon in Baltimore, Maryland U.S.A.
Yoshiki, joined by long time friends and members of monster rock band from Japan guitarist PATA and bassist Heath of X Japan were present as support for Yoshiki's classical performance to commence the following day gave a press conference at Otakon 2014 in Baltimore, Maryland on Saturday August 9th, 2014 also as use to promote the upcoming Madison Square Garden event on October 11th, 2014 where X Japan will be bringing their entire show to the 'Big Apple' during the week long event of New York Comic Con as the band will also be present. Yoshiki also tells us that their will be something big happening as he will set off to New York after the YoshikiClassical Concert tomorrow in D Hall at the conventions center for 20+ interviews and to visit Madison Square Garden finalizing details for the scheduled X-Japan concert and we will find out soon what the big news is. We do know he will announce tour dates but what else he has in store for fans of X-Japan and it's members....we will have to wait and see! 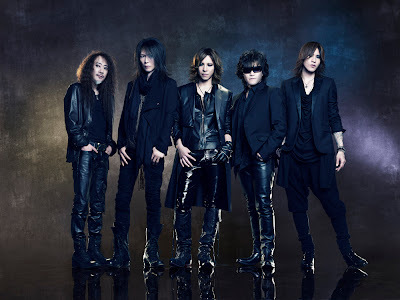 Q: X Japan last played in 2010 as part of a short U.S. tour and then followed up with a world tour in 2011 and this October will be playing at Madison Square Garden in New York City and then later in Yokohama arena in Japan. Will another world tour be able to follow the MSG show within the next year or sometime in the foreseeable future? Q: Are these shows to promote your album, or are these just great opportunities for X Japan? Yoshiki: Well, we haven’t released an album in a long time, though we released a compilation CD just a few months ago. About 22 years ago, we had a press conference at Madison Square Garden in New York, no at Rockefeller Center when we signed with Atlantic Records. That was supposed to be a big deal, we were then supposed to release an album, but a lot of things happened. So, 22 years later, we come back to New York and are playing a show. I can’t really tell you why we’re doing this MSG show, but you are going to know soon. There is something going on. Yes. Q: Yoshiki, you've been involved with charity projects, such as the Red Cross for tsunami relief. Can you tell us a little about what you've taken away from those experiences and whether you have any projects like that planned for the future? Yoshiki: When I was 10 years old, I lost my father to suicide. So I had a pretty depressed childhood. So I kind of understand the pain children have, so several years ago I decided to create my own charitable foundation. I try to support children who have that kind of pain. Unfortunately right after I established my foundation, there was the big earthquake that happened in Japan. At that moment I concentrated and focused on that, to support victims of the earthquake and tsunami. When you save people, I also feel saved for some reason. It’s like I want to keep doing this for the rest of my life, just at my own pace. Q:Yoshiki, you've been touring Yoshiki Classical…I was wondering how preparing for that differs from preparing for X Japan. Pata: Maybe the same thing. I just play guitar. Yoshiki: X Japan is pretty much my life. Everything else is like a side project. Even on my classical tour, when I went to many countries and places, I said, “X Japan is my life.” It’s not like we’ve been doing different projects and coming back to this…it’s not like we just got back together and played….X Japan just runs in my blood. X Japan is more than a project. It’s our lives. Q: How did you first find out about Otakon, and what made you come back again? Also, what are your thoughts about Baltimore as a city? Yoshiki: because you guys are so cool! Yes, I came here for the first time in, what, 2008? 2007? 2006. Wow, that’s like 8 years ago! So that means Otakon was my first convention experience. At that time, I wasn't even doing X Japan and I wasn't even talking to Toshi. Since then a lot of things have happened. We didn't know we had that many fans in America, or even outside of Japan, so we started finding out that whoa, people throughout the world have started listening to our music. It was so cool surrounded by these people. This is our third time in America though, in 2010 we played at Lollapalooza. So 2006, 2010, 2014…I’m going to be here in 2018, then. Every four years, like the Olympics. Q: All your fans call you a “vampire” and that you should play Lestat in a movie. When are you going to do a vampire-themed rock opera? Yoshiki: Huh, good idea. I think I have a split personality about some things. Sometimes I’m called a vampire, sometimes I’m Yoshiki, sometimes I’m a character called Blood Red Dragon, created by Stan Lee…. Wherever I am, struggling during the Yoshiki Classical World Tour over 10 countries, I always stayed up nights. It’s something vampirish…is that a word? It is now (laughs) I’m only half joking, half serious. Sometimes I say I’m half Japanese, half vampire, something like that. I just love the image of the vampire, you know. So yeah…it’s a good idea to create a vampire rock opera. That’d be cool. Q: You’re not just a musical icon but also a fashion leader. How do music and fashion relate for you? Yoshiki: Before my father died, he used to own a kimono shop, a Japanese traditional clothing shop. I grew up in that kind of environment, so I was always surrounded by kimonos. When we started X Japan, we put on a lot of interesting clothes and makeup, and dyed our hair red and purple. So fashion and music are inseparable, at least to us. Fashion is music, music is fashion, so it’s very natural to have both. Everything came very naturally. Now I have YoshiKimono clothing line. Actually, I’m going to be debuting the 'YoshiKimono Tokyo Collection 2015'. Q: You’ve been involved in a lot of different collaborations–credit cards, wines, just to name a few. What other products would like you to release in the future? Q: Heath We saw a video once in the past. It was Phantom of the Opera styled, you were in a cage coming down, you had people doing robot dances around you, and there was an incredible bass solo…will you ever do something similar to that again, especially in a venue like MSG? Heath: I think that rock needs something very shocking, both visually and musically…that is rock, that is X Japan. Madison Square Garden has shock to it, that is not like something before, so I’d like to do a new kind of shock there, in the near future, please look forward to it. Q: Have any of you have had memorable experiences interacting with your fans? Q: Some of the songs on Yoshiki Classical were previously released and performed with vocals. For example, “Amethyst” was originally written for Violet UK, how are you able to convey the messages of the original vocal version of the songs in the instrumental version? Yoshiki: “Amethyst” was classical from the get go, so I didn’t write lyrics first…I wrote the lyrics later. What happened was, we had an incident at a Tokyo amusement park, an X Japan event. At that particular attraction, my classical music was playing. One of the old members, Hide, said, “What is this song? This is one of my old compositions (I said). We should use this at the Tokyo Dome for X Japan’s opening.” Like, really? ", I didn’t even think about that. Then, that was the the beginning of using “Amethyst” at the Tokyo Dome X Japan show. Yoshiki, PATA and Heath for their valuable time in speaking with us and the OTAKON Press Staff for all of their coordination's the whole weekend and LaLa Sukura Press Op's. X-Japan tickets to Madison Square Garden Event in New York City on October 11, 2014. Never Miss Another Show In Your City! Keep In The Know!